Our award-winning faculty has developed a result-oriented program that will prepare you for a wide range of opportunities once you graduate. M.Acc. holders typically earn higher salaries than accountants with only a bachelor's degree and can choose from among career opportunities with the local, state or federal government; local, regional and national CPA firms; and not-for-profit organizations, including educational institutions. Our rigorous curriculum will provide you with the advanced accounting knowledge and technical skills necessary to excel in the dynamic business environment and will open the doors of opportunity leading to a challenging and rewarding career. Why Stetson University's MAcc Program? Stetson University's Master of Accountancy (M.Acc.) program is a convenient, high-quality program is offered at the university's DeLand campus and online and can be completed in as little as one year. As a M.Acc. student, you can benefit from our rigorous curriculum, designed to provide you with an advanced, graduate-level education in accounting and the related areas of information systems and business. Taught by a faculty of highly qualified and award-winning teacher-scholars and professionals, our program is designed to complement your preparation for the CPA examination (if you have not already completed it) and/or help you meet the 150 credit hours required by many states for CPA licensure. Moreover, completing the M.Acc. program will expand your knowledge in accounting and help advance your career, as well as provide you an important graduate degree credential for pursuing a new position, a promotion or even a college-level teaching position. Stetson University is a small, private institution that values every individual and provides each of them with a quality education. At Stetson University you're never just a number; we take the time to ensure that you are satisfied with the path your education is taking and we will even assist you with career placement after degree completion. Studies have shown that our graduates move to mid and high-level careers within four to six years of graduation. Our demanding academic environment produces leaders with a world of opportunities now open to them. 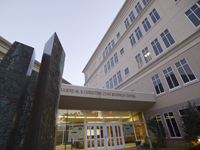 Stetson University is ranked among the top three best Southern masters-granting institutions by U.S. News & World Report and is one of 183 elite business schools world-wide with both our accounting program and School of Business Administration fully accredited by the Association to Advance Collegiate Schools of Business (AACSB International).